Burn Energy Drink is made by Coca-Cola and originally was launched in just Europe. However, Burn is now available in most regions of the world except for Oceania and Southern Asia. All flavors of Burn have the same caffeine content. Burn Energy Drink focuses its marketing efforts on the Formula One racing genre and extreme sports. Caffeine-wise Burn is comparable to other popular energy drinks like Red Bull, Monster, and Rockstar. Water, sugar, acidifier citric acid and sodium citrate, carbonic acid, taurine (4.2 g / l), glucuronolactone (2.55 g / l) and Allura red dye caramel, flavoring including theobromine, preservative potassium sorbate, caffeine (350mg / l), inositol (120mg / l), niacin, an antioxidant, ascorbic acid, pantothenic acid, guarana extract, vitamins B6 and B12. Sugar content: 26.6 grams (per 16.91 ounces). How Does Burn Energy Drink Compare? 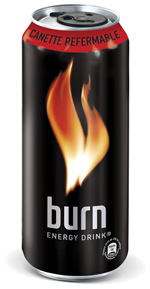 Burn Energy Drink contains 9.46 mgs of caffeine per fluid ounce (31.99mg/100 ml).